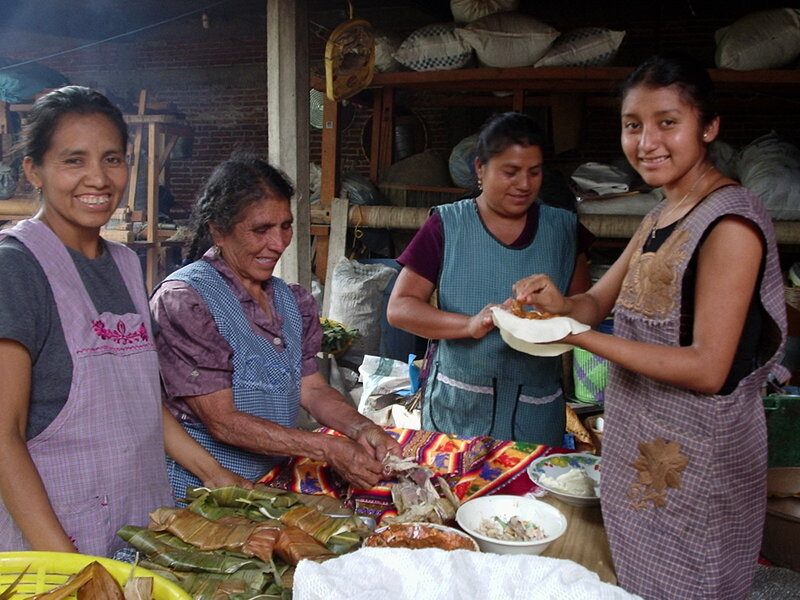 In 2005, our friend Annie Burns invited Stephen and I to visit her in Teotitlan del Valle, where she was now living permanently. She told us about a young mother and mother-in-law who were at a loss to figure out how to provide income for themselves and their three children/grandchildren after their husbands had died earlier that year. That is how we came to know Josefina Ruiz Vazquez and her mother-in-law Magdalena. Josefina’s husband and Magda’s son was a famous weaver (Eligio Bazan) who died suddenly of a rare form of cancer at age 38. Annie said she was encouraging them to start a guesthouse and asked if we would be the first guests as an experiment to get the venture launched. Of course, we said yes, and that is how Las Granadas Bed & Breakfast was born. Now, four years later, the house at 2 de Abril is transformed into a garden paradise in large part through the effort of the two women and the help of Roberta Christie, a Florida State University administrator, who took early retirement and helped renovate the compound. 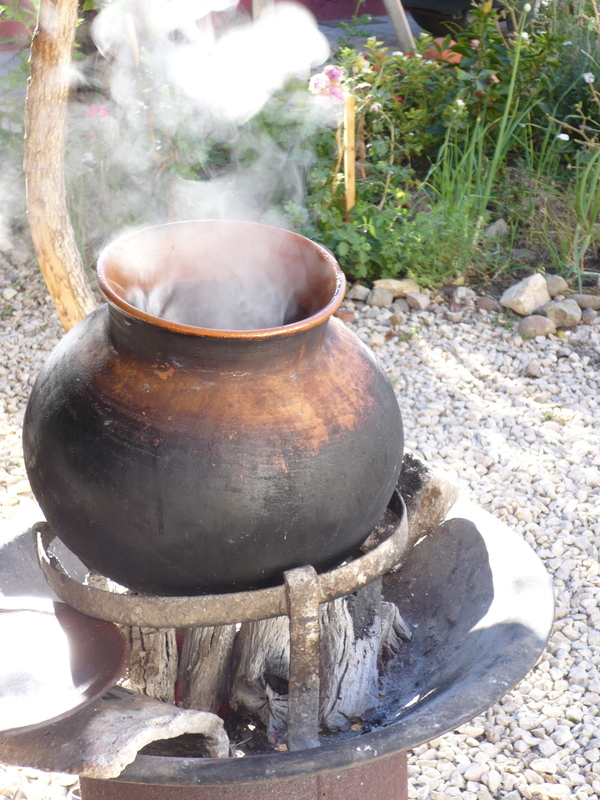 Lush bougainvilla, clean, basic rooms, and fruit-bearing pomegranate trees surround the outdoor kitchen where Magda now prepares her famous hot chocolate made from cacao beans she roasts herself. 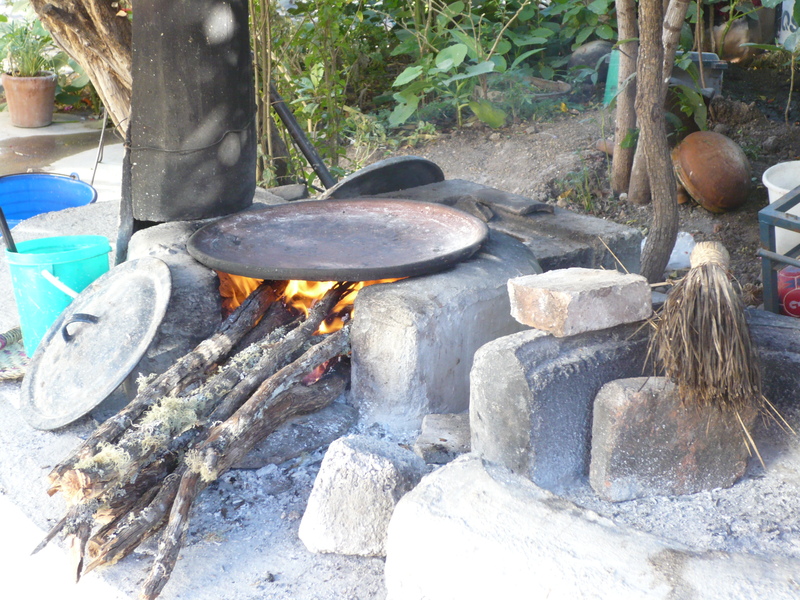 During the early morning hours before breakfast, you can see Magda at the comal (outdoor wood fired clay griddle) preparing the fresh maize tortillas that she mixed earlier, turning them with her fingers. 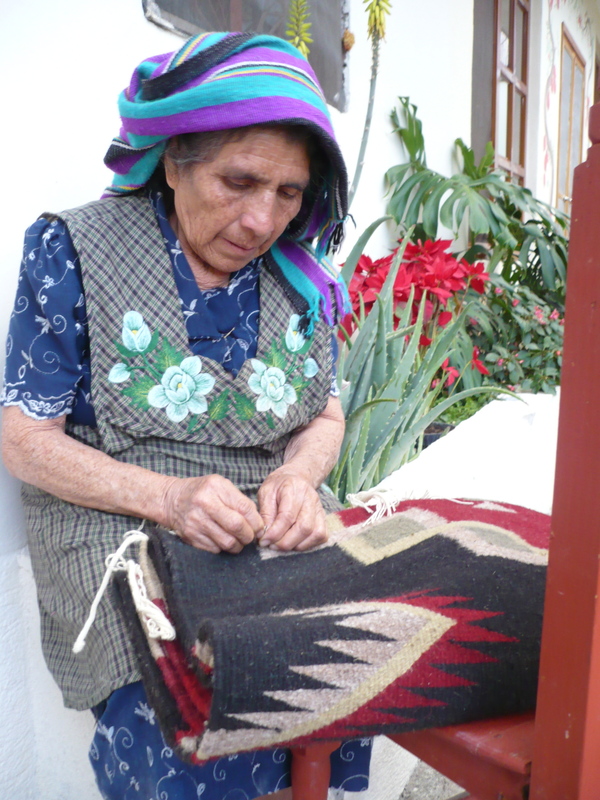 Now, participants who enroll in the workshops and small group tours offered through Oaxaca Cultural Navigator: weaving, natural dyeing, oil painting, documentary filmmaking, enjoy a stay at Las Granadas as part of the package cost. I asked Roberta to talk with Josefina about her life as an innkeeper. Here is her response. 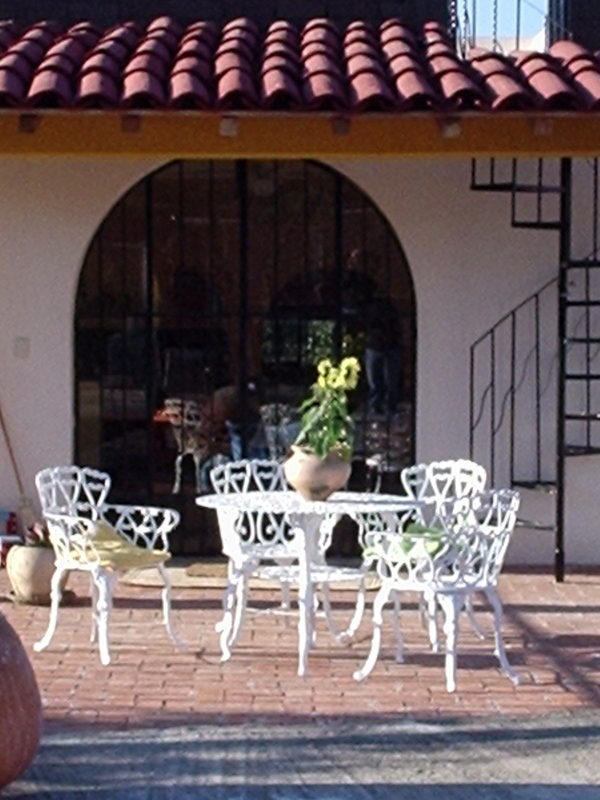 R: What things do you enjoy most about operating a B&B in Teotitlan? J: I like everything about it. I enjoy working in my own home and making sure that our guests enjoy their stay with us. It is very interesting for me and my family to get to know people from other countries. I especially enjoy cooking for our guests and am proud when they finish every bit of food on their plates. They seem to especially enjoy the fresh fruit and fresh juice I serve at breakfast, and many say they have never tasted such good eggs — all from local chickens. Everyone enjoys the quesadillas straight from the comal. I’m also pleased to serve vegetarians the things they want to eat. Luckily I can get fresh vegetables every day at our market. R: How has Las Granadas made a difference in your life? J: With the income, our life has improved a lot. I sleep better (laughs) because I feel confident that I will be able to support my family. 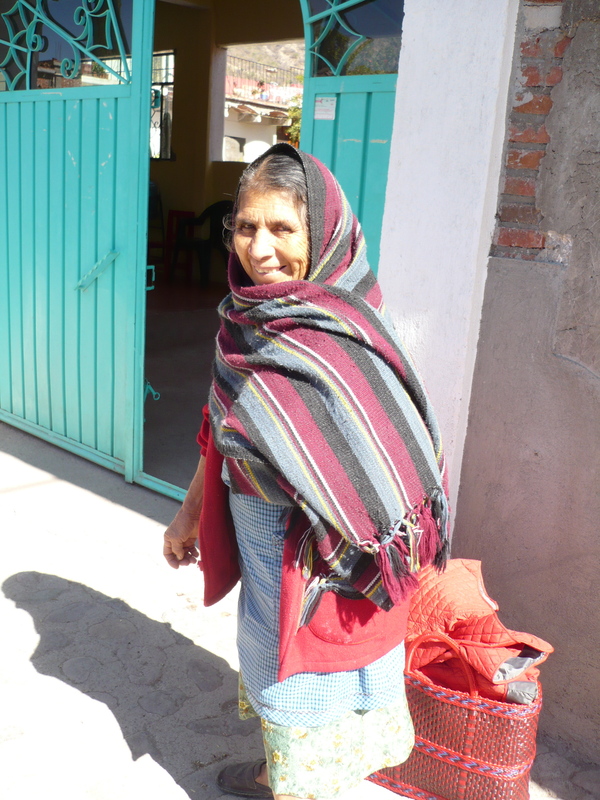 We’ve also been able to sell some tapetes (rugs) and bolsas (shoulder bags), and Magdalena has sold chocolate. This is also good for us and is very satisfying when people tell us how beautiful the rugs are and how delicious the chocolate is. R: What are your plans for the future? J: We are making improvements to the house and second level using some of the income from room rental. I want to eventually put tile on the kitchen and patio-level rooms. Poco a poco, Las Granadas will become even better and we hope even more people will come and enjoy their stay with us.